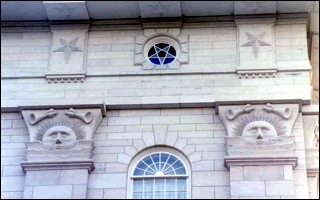 One of the more well-used and worn-out attacks from our critics has been the Church’s use of the symbol of the pentagram (a 5-pointed star) on some of our temples, most particularly on the early temples of this dispensation such as the Nauvoo Temple. In an sweeping gesture they pass these symbols off as absolute proof that Mormonism is a Satanic organization. They cannot imagine why a so-called Christian faith would even think to use such symbols when it is so clear to them that they are evil and of the devil. To the Hebrews the five points of the pentagram were tied to the Pentateuch (the first five books of the bible) and represented as a whole the concept of truth. There are many connections between the pentagram and Christianity. Before the cross, it was a preferred emblem to adorn the jewelry and amulets of early Christians (followed by an ‘x’ or a phoenix). The pentagram was associated with the five wounds of Christ, and because it could be drawn in one continuous movement of the pen, the Alpha and the Omega as one. A ‘point down’ pentacle is nothing new, nor is it necessarily Satanic when it appears as such. Historical depictions of the pentagram were as likely to be points down as point up; a distinction between one or the other was rarely made by the ancients. Perhaps most curious is the pentagram as it relates to early Christianity. Constantine the Roman Emperor who converted to Christianity chose to use the pentagram on his seal and amulet. Up until medieval times, the five points of the pentagram represented the five wounds of Christ on the Cross. During these times the pentagram carried no evil implications at all and in fact, in a lesser way than the cross, was symbolic of the Savior. Up until medieval times, the five points of the pentagram represented the five wounds of Christ on the Cross. It was a symbol of Christ the Saviour. This is in stark contrast to today where the pentagram is criticized by modern Fundamentalist Christians, as being a symbol of evil. The church eventually chose the cross as a more significant symbol for Christianity, and the use of the pentagram as a Christian symbol gradually ceased. The adoption of the pentacle as a Satanic emblem is quite recent, dating only to the latter half of the twentieth century. Eliphas Levi (born Alphonse Louis Constant), a former Roman Catholic priest, in 1856 turned the previously harmless Jewish and Christian pentagram into a ridiculous Satanic symbol. In the nineteenth century Eliphas Lévi, an Occultist, was the first to adapt the inverted pentagram as symbolic of evil. Probably due to misinterpretation of symbols used by ceremonial magicians, it later became associated with Satanism and subsequently rejected by most of Christianity sometime in the twentieth century. It’s amazing what a few minutes of Google will do. For most of human history the pentagram has symbolized good things – the heavens, stars, health, scriptures, truth, and even the Savior, Jesus Christ. The adaptation of the pentagram into a Satanic symbol is a modern invention, another attempt of the Adversary to turn everything that is good into evil (Isaiah 5:20). FAIR also has gathered some good research on this subject. Thank you for the link. It has great information about the pentagram as a Christian symbol. Indeed, the very city seal of Jerusalem was a pentagram. Great Post! Actually your whole site has been great, keep it up. “I had a very pleasant opportunity to visit the Wilshire Jewish Temple, in Los Angeles recently. The Rabbi very graciously gave the Mormons a tour. LOL, yes that is the picture! Thanks, I wanted a copy of that picture. Hex Sign – The Forgotten Symbol of Jesus – This Jewish symbol was adopted by the earliest Christians and has been closely associated with birth and burial for over 2,000 years. It can be found in the Tomb of Mount Olives in Jerusalem and also in Gettysburg, Pennsylvania. A case can be made for this design being the oldest symbol to represent Christianity. That Rublyov’s icon is located now in the Annunciation Cathedral in Moscow Kremlin. Thank you! I am so tired of having institutions that claim to be educating the public be so ignorant and stubborn. It is great to see a Faith list clear unbiased history and symbology. I am puzzled. What is the authority for the proposition that the pentagram, before the cross, was a preferred emblem to adorn the jewelry and amulets of early Christians. This is important. This bit of information, if substantiated, would go far in quashing the histronics of some Christians who believe this to be a “cultish” symbol. Or am I missing something? I mean, this should cast pentagrams in a rather favorable light with other Christian denominations. The pentagram in Hebrew is called Hekhal and derives from the Summerian E.GAL meaning ‘temple’ and refers specifically to the Holy of Holies in King Solomon’s Temple. Hekhal in Arabic refers to the human body. It is thought that the pentacle or five-pointed star may well be connected with the planet Venus as both morning and evening star which the ancient Hebrews and Canaanites worshipped as Ashtoreth/Astarte. She was otherwise known as the Shabbat Bride or Bridal queen of Heaven whose epiphany was witnessed as the Shekinah or Holy spirit. I was reminded of this thought provoking thread because of Paul’s comment posted March 8, 2014. Outside of a single item recovered in an archeological dig near Jerusalem (dated roughly 150 bc), I personally am unaware of any other archeology supporting the claim that the pentagram was ever a symbol of Jerusalem. The item itself does not purport to be the symbol of Jerusalem, much less a common one. So far as I am aware, no other archeological find suggests such a conclusion, which borders on speculation or even wishful thinking if the archeological record is in fact so sparse. We might expect to find many pentagrams from the relevant strata if the pentagram in fact held such important symbolic value to the Jewish people. Moreover, I’ve yet to see any archeological evidence that the pentagram was a symbol of Christianity in antiquity. None. Constantine lived 300 years after Jesus. Medieval Christians, much later. I am rather interested in Christian symbols in antiquity. And I’m having a difficult time finding research on the topic. Hopefully my comments above reflect my lack of information, or just plain ignorance, which I am fully willing to concede if other information exists. I am a willing student. Joseph Smith’s instructions I think are properly considered in another context apart from archeology. But – here – I would really like to hear about some archeological evidence that might suggest the pentagram was an important early Jewish or Christian symbol. Your thoughts are appreciated. Thank you all for your consideration. I’m not a Mormon, but this is historically true. The Pentagram was a Christian symbol. And you know what, so was the upside down cross. When the apostle Peter was to be crucified, he requested to be done so upside down. He felt he wasn’t worthy to die the death that our savior had died, and he got his wish fulfilled. A lot of people think it’s a satanic symbol, but in reality, it’s a beautiful symbol on how we are to humble ourselves before Jesus – the one who humbled himself on earth.